INTERLINK Language Centers at the University of North Carolina at Greensboro (UNCG) has been helping students achieve their personal and professional goals since 1997. Located in Greensboro, North Carolina, INTERLINK offers intensive English instruction, academic preparation, and cross-cultural orientation for students, scholars, and professionals on a year-round basis. The program prepares students for challenging careers, and provides the tools and skills needed to achieve success in the 21st century. Upon graduation, many students go on to study in academic programs at UNCG or other area universities. INTERLINK’s curriculum is rigorous. Its six levels, offered in 9-week sessions, involve in- and out-of class assignments in listening, speaking, reading, writing, and projects which require active student participation. Students enjoy full access touniversity facilities, including opportunities to meet students and professors, audit or take classes for credit. Program field trips enable students to learn firsthand about the state and local community. 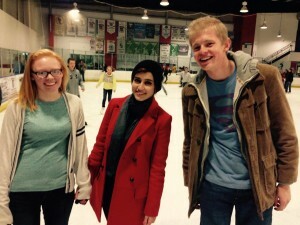 Of particular benefit to students is the representation of many cultures in the program. In a diverse environment, students learn more about the world, and in the process, about themselves. Academically qualified students enjoy the convenience of receiving conditional admission prior to starting their language program at INTERLINK. At INTERLINK, we strive to assure a memorable and transformative educational experience for international students. If you are looking for an English as a Second Language program, especially if you plan to study at an American university, we hope you will consider attending INTERLINK at UNCG. A prosperous city of around 250,000, Greensboro is situated midway between North Carolina’s attractive seashore and its beautiful mountains. Spring comes early to this part of the country, with flowers in full bloom in late March, and winters are mild. Greensboro has been rated as one of America’s most outstanding mid-sized cities, with its own symphony orchestra, ballet, theater productions, public golf and recreational facilities. The mild climate, moderate cost-of-living, excellent medical services, six colleges and universities, shopping centers and diverse international population make Greensboro a safe and enjoyable place in which to live and study. Find more information about the city of Greensboro here. *Starting Fall II, 2019, tuition will increase by $150. The above costs do not include books (approximately $100/term); personal expenses; transportation; or expenses for dependents (about $500/month each). Please contact the center if you have any questions. The UNCG Facility Fee and Medical Insurance usually increase each year between Summer and Fall. Students may enroll for shorter periods (4 weeks minimum) but must begin at the start of the term. Tuition is $360/week. This does not include Health Insurance or University Fees. All students requesting a refund will receive a full-tuition refund during the week of registration. No tuition will be refunded for four-week terms after registration week. During the second week, 50% of all tuition paid for the term is refunded. After the second week, no tuition refunds will be made for the term. Refunds for students who must withdraw because of illness or emergency will be considered on a case-by-case basis. Board refunds will be prorated as per standard UNCG policy. No refund will be given for application fees, room, university fees, or insurance. Students who want to live in the on-campus dorms must pay a $100 non-refundable deposit and $75 refundable key deposit three weeks before the first day of orientation (the first class date). If the student does not pay this deposit, they will not be eligible for on-campus housing. On the return of the room key, the student will receive their $75 deposit. Students can move into the on-campus housing a maximum of one week before the class start date. The student must email aa.uncg@interlink.edu to confirm their arrival date and time. We can only move students into the on-campus room Monday – Friday 8:30 AM-4:30 PM. Homestay – A limited number of homestays may be available. Please contact the INTERLINK main office for more information. See options at American Homestay Network. Off-campus Apartments – INTERLINK provides information about apartments located near the UNCG campus; however, we are not involved with contracts, security deposits, or the furnishing of apartments. It is best for students to see apartments before signing a contract, so we recommend arriving at least one week before the beginning of classes to visit sites and to complete paperwork. Prices typically range between $400-$800 per month, depending on the type/size of the apartment and the number of roommates. The length of the contract ranges between three months and one year. Students who are admitted to INTERLINK can request a list of apartments that have been recommended by current and former INTERLINK students. On-campus housing/Dormitory – Living in a dorm provides great opportunities for learning English and meeting people. UNCG dorm rooms are very basic and include (two) beds, desks, chairs, closets or armoires, and chests of drawers. Each room also has a computer jack or wireless access and is air-conditioned. Prices for INTERLINK students currently range between $1140-$1705 per 9-week term, depending on the type of room available. Students who live on campus are required to purchase a campus meal plan, which costs $887 per 9-week term. Payment for both the room and the meal plan is made directly to INTERLINK during the first week of class. Students interested in staying on campus should contact INTERLINK to find out whether space is available. A $100 deposit is required to reserve a space. Dedicated to a global education for its approximately 18,500 students, The University of North Carolina at Greensboro (UNCG) is a comprehensive university providing excellence in undergraduate and graduate education. Among the 16 universities in the North Carolina educational system, UNCG is one of only a few which award doctoral degrees. The university offers master’s degrees in 68 academic subjects and doctoral degrees in 14 areas of study (see programs here). UNCG also has a full range of undergraduate majors. The campus is conveniently located near the center of Greensboro, which has been rated as one of America’s most outstanding mid-sized cities. 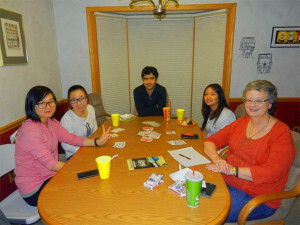 INTERLINK’s Conversation-Partners Program offers non-native English speakers a chance to learn outside of the classroom with English-speaking peers. The goals of this casual experience include: helping an INTERLINK student improve his/her English; learning about a new culture; building awareness of world views; and possibly forming new friendships. 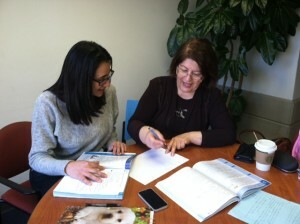 It is important to note that the Conversation-Partners Program is not meant to be a tutoring or homework-help service. A conversation partner agrees to meet with his/her partner at a mutually convenient time and place to talk, listen, and learn. We ask that participants be willing to meet with their partner for at least one hour, once a week for three months. Any UNCG or INTERLINK student is welcome to apply to the program (the INTERLINK student should be in level 2 or higher). The meetings will be in English. You must be available for at least one hour a week for three months. Also, you must be committed to talking, listening, and learning about another culture. We accept applications on a rolling basis, but most participants are paired at the beginning of each 9-week session (January, March, May, August, and October). Anyone interested in the program must fill out the the online application. Please be aware that you may need to wait a few weeks before you are matched. Once you are matched, you will receive an email from the INTERLINK office with your partner’s name and email. We do our best to pair participants based on common schedules, interests, and preferences. 1.) Look at the Conversation Partner Handbook HERE for the answer. 2.) If you can’t find the answer in the handbook contact our Student Assistant, Heaven Pearce, at Heaven.Pearce@interlink.edu. INTERLINK is always looking for volunteer tutors. Tutors typically meet one-on-one weekly with a student and help him or her improve specific language/academic skills (often in close consultation with an INTERLINK instructor). Tutoring an international student can provide great experience, especially for those planning a career in education and/or those looking to increase their intercultural competence. To get started, fill out the Volunteer Tutor Application. If you are more interested in observing classes or acting as a class intern, please fill out this survey instead: Observers and Intern Application. Please read the Tutoring Handbook before beginning the tutoring process. For more details, please contact the Academic Coordinator, Katheryn van Laar, by email at klaar@interlink.edu. provide an emotional support system for students who may be far away from their own family. If you are interested in hosting an international student, fill out the Friendship Family Application and we will try to pair you with one of our current students. We are open to all types of families including traditional, retired couples, singles, or single-parent families. All walks of life and economic levels are welcome into the program. As a friendship family, we want you to encourage students to meet with you often throughout your time together. The types of activities and number of activities done together varies from family to family. Click here for the Friendship Family Application. For more details, please contact the Director, Giovanna Alessio, by email at galessio@interlink.edu.